Five to six inches long. Bright red forehead, throat and upper breast. Brown back and wings, long brown tail. Dull white underside streaked with brown. Short broad beak. 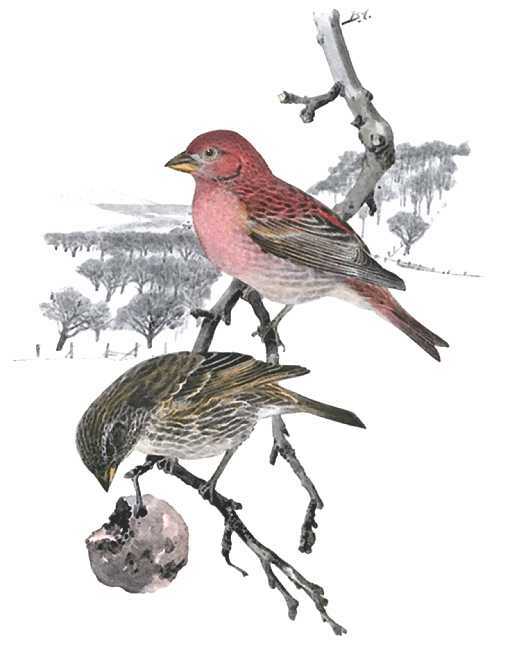 Often mistaken for the Purple Finch, however not quite as richly colored. Native in the West and most of Mexico, originally with a broad range of habitats from forest edges, smaller wood stands, and deserts. Now inhabits mostly towns and cities. Introduced in the East (New York), and has since spread back westward throughout the U.S. and southern Canada. Hawaii too. One of the most populous birds in inner cities throughout the continent. House Finches are accustomed to people and a favorite back yard bird, some fruit growers being an exception. They are bubbly singers mixing in chatter and other indescribable sounds. Plant liquidambar (sweet gum) and birch trees, marigolds, zinnias and sunflowers to attract House Finches. 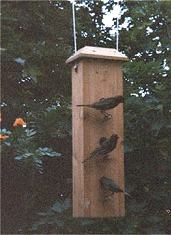 Flocks, usually families of finches, often dominate feeders in large enough numbers to chase away house sparrows. Although they also sometimes tolerate each other. Parent House Finches bring their young to back yard feeders shortly after fledging where they must shell the seeds for them for the first few days. It’s hard to tell the difference between the parents and their young until you see who’s begging and who’s feeding. Lays two to six white eggs which hatch after about two weeks incubation and young leave the nest in about another two weeks. They may raise several broods in a season. The House Finch Birdhouse has a 6″ by 6″ floor, 6″ inside ceiling, 2″ diameter entrance hole located 4 1/2″ above the floor and ventilation openings. Assemble with corrosion resistant screws and fit to pre-drilled countersunk pilot holes. Secure hinged roof with shutter hooks for easy access. Mount on a post in the middle of a yard just out of reach. Watch the house. With a 2″ entrance hole, mobs of House Sparrows and Starlings may also want this house.